The field of biocultural diversity is emerging as a dynamic, integrative approach to understanding the links between nature and culture and the interrelationships between humans and the environment at scales from the global to the local. Its multifaceted contributions have ranged from theoretical elaborations, to mappings of the overlapping distributions of biological and cultural diversity, to the development of indicators as tools to measure, assess, and monitor the state and trends of biocultural diversity, to on-the-ground implementation in field projects. 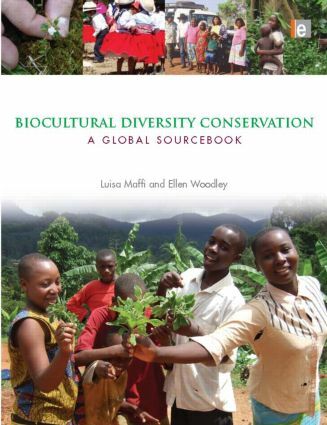 "Biocultural Diversity Conservation is an eye-operner: it sheds a whole new angle on biodiversity, culture and language in relation to the way the world is changing." William Critchley, WASWAC. "It is fascinating, and we, the scientific community, need to be aware of this extraordinaty and important relationship between plants, animals, culture and language." William Critchley, WASWAC. "The authors call for policies that value cultural diversity and creativity, empowering people, rather than distincing them from the knowledge and practices that have supported survival and adaptation over generations." New Agriculturist. "Biocultural diversity is a concept that had not meant too much to me before I traveled to Tofino. But the more I understood and thought about it the more sense it seemed to make. Biocultural diversity conservation--the preservation and respect of all human diversity within the diversity of the rest of life on Earth may be a good place to find solutions." David Braun, Tofino, Canada, Natgeo Newswatch. Luisa Maffi, Ph.D., is a linguist and anthropologist, and one of the originators of the field of biocultural diversity. She is co-founder and Director of the international NGO Terralingua. She is based in British Columbia, Canada. Ellen Woodley, Ph.D., works as an ecological consultant in environment and development, specializing in issues of local and traditional ecological knowledge. She is based in Ontario, Canada.